Since they happily agreed, I did some research, consulted a few people, and used Google maps for the geographical location of the best places in the island. Fortunately, the Samal itinerary below turned out to be just what we wanted. The weather was also on our side, so we could follow the schedule as planned. I'm sharing our adventurous Samal itinerary with you (with minor edits). Hope you'll get an idea on how to spend your holidays in the island. 7:20 onwards Pitch tent, have dinner and explore the resort at night. (Note: if you want to order dinner at the resort, get there earlier). 5:30 - 6:30 a.m. Dip in the water during moonset. 8:00 - 9:00 a.m. Observe more than 2 million bats in their natural habitat. 9:15 - 9:30 a.m. Take the ferry from Marex to the vanishing island. P500.00 / boat (back and forth), max capacity is 10. 9:30 - 11:45 a.m. Explore vanishing island; snorkel. 5:30 to 6:00 a.m. Watch sunrise and moonset. 7:30 - 8:00 a.m. Trek back to the jump-off point. 1:30 - 2:00 p.m. Take the boat and cross the strait to Isla Reta Beach Resort in Talicud island. 2:00 p.m. onwards Snorkel, pitch tent, chill, watch moonrise, and explore Isla Reta Beach Resort. 8:00 - 9:00 a.m. Take a privately hired boat to Coral Garden. P3,500.00 / boat, max capacity is 8. This includes the ride to Taklobo Sanctuary to Adecor community. 9:00 - 12:00 nooon Snorkel, snorkel and snorkel; eat lunch. 1:00 - 2:00 noon Observe colorful, cultured giant clams. 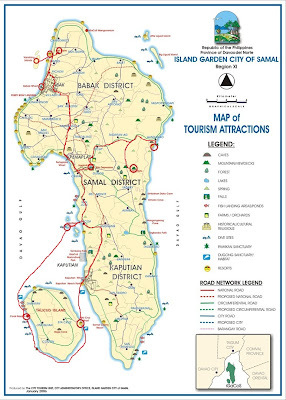 The map on the right illustrates how this island is explored with this Samal itinerary. Got the map from the Internet. Please take note, though, that this Samal itinerary is not for people who are looking for convenience and comfort during their vacation. At the end of the trip, you may experience muscle pain all over your body, especially if you're not used to trekking and backpacking. However, I can assure you that at the end of the adventure, you'll be able to appreciate the island better. For habal-habal drivers, please contact the names below. We were with them during this trip, but if they have changed their numbers, just find one on the island. As far as our experience is concerned, most drivers are tourist-friendly. Let me know if you're using this Samal itinerary or if you have other suggestions to make this schedule better. hi. can i ask if you have the contact number of the habal-habal driver? thanks! Great stuff! Im from Davao and I havent really explored Samal. Will do this itinerary in the summer. I'll be a solo woman traveller though. Do you have an impression that it will be safe for me? 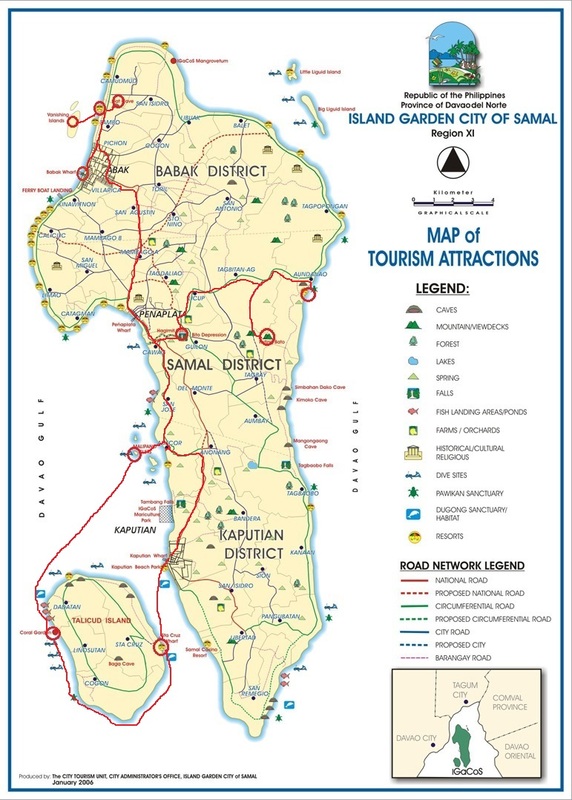 I think Samal is relatively safe, but I would rather camp with someone in Puting Bato. By the way, if you take the night trek in Guillon trail, I wouldn't recommend going to the peak. There's a section where you have to jump or go down with a rope--something you have to bring yourself--to a huge rock. There's another camp site though, you can stay there until morning. You also need a guide, so be early. Ask if the habal-habal driver knows one. Sorry kind of stupid question here. where do you put your bags while you are on tour or going to places? do you always carry it with you? Hi Greta, not stupid at all. :) Most of the time, our backpacks were with us. When we went for a dip, we took turns. When we were at the resort, we asked if there was a place to deposit our bags. I hope this helps. hi! may contact number ka ng marex? thank you! :) planning to go there this december..
Hi Audrey, I'm sorry I don't have their contact number. :( In case wala na silang vacant rooms, try mo rin yung nearby resorts. Hi I'm planning to trek puting bato alone. Is it safe for a solo goer? Sorry medyo late ang reply. For solo trekking, I'd opt for the easier trail (Tayapok), but I can't remember I saw signs to the peak. You might get lost if it's your first time. Not sure though kung may mga signs na ngayon. Hope this helps.